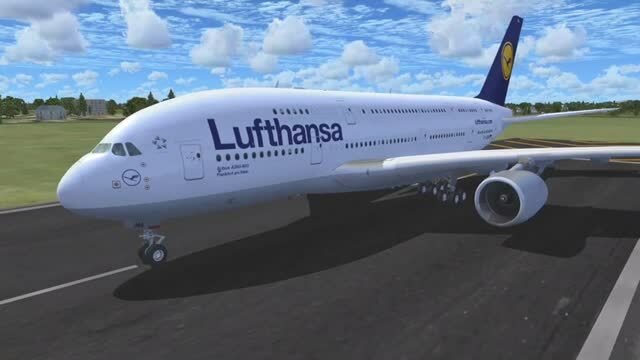 Lufthansa Airbus A380-800. The Project Airbus A380-800 with dynamic wing flex, accurate LAF simulation, parallel bogies, drooping control surfaces, hard-coded double strobes and more than forty custom XML parts. Repaint by Derek Mayer. Water rudder up/down (not assigned to a key binding by default): deactivate window wipers. The archive pa380_lh_fsx.zip has 55 files and directories contained within it. Having always enjoyed flights using this aircraft in the past, I was particularly looking forward to putting it to the test with the new additions and updates that were put together. The first thing I noticed, though, was that the job done on the re-painting of this Airbus A380-800 was one of the most impressive I have seen for this aircraft itself. It captures all of those specific little features that we all love to see, ensuring that it all comes together and looks the part. This hugely impressed me to begin with but I was even more impressed by the huge range of detail that was included everywhere else – this is more than just a repaint, that’s for sure. The installation process was another rally positive thing, as I managed to get the full project up and running in a matter of minutes. It took a few simple extractions of files to get it running, so that was a nice bonus. Additionally, although this was made for FS9 I was told it would work in FSX; and I have to say that it seems to work just fine. If you do have an issue, users at their local forums might have some answers for you. Onto the actual aircraft, though. Its list of features was incredibly impressive, with a whole range of unique additions such as a dynamic wingflex and a control surface droop that occurs when the engines are turned off. It’s these little things that really do make all the difference, and is the most enjoyable part of the entire process for me, personally; having those little barometers that just change it from a good add-on to a great one. One thing that I especially concentrated on, though, was the fact that it had so many little animations and customized features included. From the gears and the flaps to the pack vents, everything on here actually feels alive. It might take a bit of getting used to but take nothing away from the depth and quality of the design – it really is quite phenomenal. Add in the fact that it flies just as it should as well, with many hours’ worth of research and testing being put into this project, and it’s simple to see why this would be such a well received and effective part of any flight sim fans arsenal. It’s got quality in abundance, and manages to capture all of the good points about the aircraft making it an extremely fun aircraft to fly. From the easy door operations that allow you to control the exit and even the fold in the wings, you’ll get access to many other passive little features such as probe sensors and window wipers working on their own in the background. These little additions really do all add up and, when you compare it to the depth and the level of detail in the model itself, you are left with a very interesting aircraft that is well worth having. Yeah no cockpit. Are you going to fix? well how is it in the multiplayer , does it crash the game there? does this work with FSX?